Help Choose The Mother of All Foodies: Vote Now on Facebook! Thanks to you and your thumbs ups, we’ve narrowed the field to 10 finalists in our search for The Mother of All Foodies. Vote for your favorite finalists (up to three!) 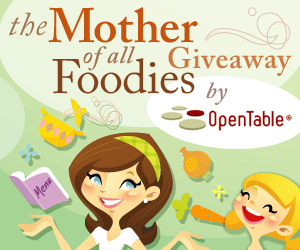 on Facebook now through May 4 to help choose the person who truly embodies the ultimate foodie! We’ll announce the winner and award a prize of 100,000 Dining Rewards Points just in time for Mother’s Day!